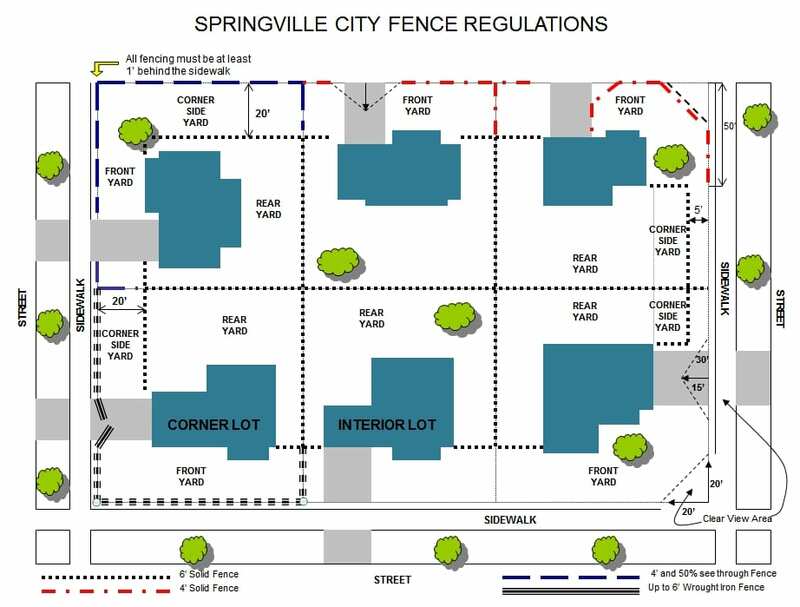 The Springville City Council has adopted regulations that govern the construction of fences and their location, size and design, to insure safe sight lines and to minimize the potential negative visual impact or hazard of high or unsightly fences, walls and/or retaining walls. Before commencing construction of a fence or wall, plans shall be submitted and approved by the Community Development Department. 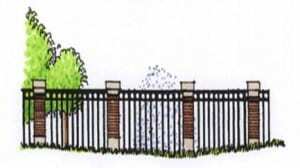 Fences greater than six-feet in height and retaining walls greater than four-feet (including the footings) in height must meet applicable requirements of the building code and a building permit must also be secured. To apply for a fence permit you will need to complete a Fence Permit Application and pay the $15 review fee (check or cash only). 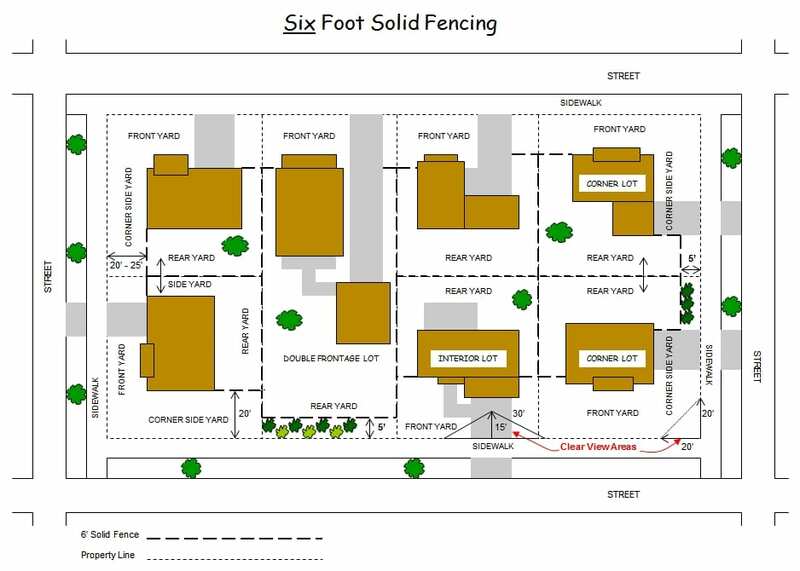 On the application you will show a site plan drawing of your property indicating the location of the proposed fence, along with, a description of the fence height and materials. You will also need to show all existing structures, adjacent streets and driveway locations. City Planning Staff will then review your application. In most cases, the permit can be issued at the counter or in one to three business days after the application is received. 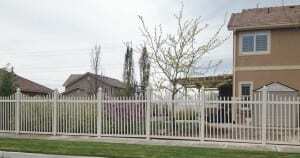 Decorative wrought iron fencing or fencing that is similar in appearance and that is at least 70% see-through may be installed up to 6′ in height one foot behind sidewalk. Corner lots that are adjacent to each other with rear yards abutting may have up to a 6′ solid fence setback at least 5′ from the street side yard property line and at a point beginning 50′ from the intersecting point of the corner property lines. Corner lots that are adjacent but the rear yard is adjacent the abutting corner side yard, then the setback for 6′ high solid fencing is 20′ from the property line. 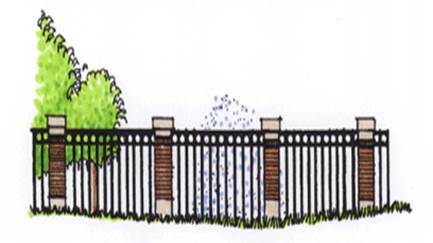 All fences shall be constructed with the finished surface facing the neighboring property with support posts placed to the inside, except in cases where the posts are an integral part of the fence design which enhances the aesthetic appearance of the fence. It is important that you know where your property lines are. If you are not sure, a Certified Surveyor may be hired by the owner. 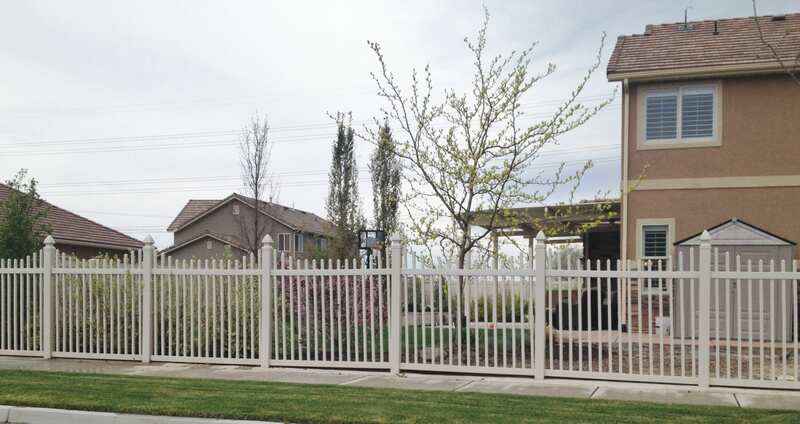 Fences should be installed on the applicant’s side of the property line, or with the neighboring property owners consent along a common property line. Property line disputes are a civil matter and cannot be resolved by the City. 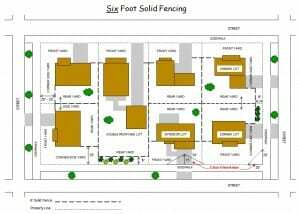 ALL fencing, regardless of height, shall be located at least one-foot behind the sidewalk and in certain situations a further distance may be required. Most properties have public utility easements along the front, side and rear property lines. 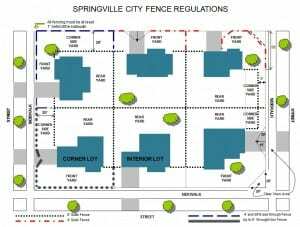 You should be aware that if a fence is located within a recorded utility easement, there is a possibility of the fence being removed should the easement become active and a use of the easement is required by the City or any legitimate utility company.